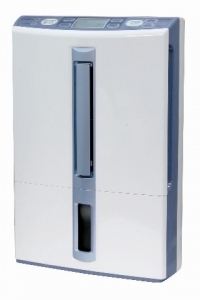 The Mitsubishi MJ-E16VX dehumidifier in our opinion the best domestic dehumidifier on the market today, the build quality of this machine is the best we have ever seen for a domestic dehumidifier. Some of the features to mention with this model are its extremely quite operation, in automatic mode for instance noise levels are 39dB. The humidity control on this machine is very accurate at 1% allowing you control humidity extremely accurately should you need to. Another feature we like on this machine in the child lock function which stops inquisitive little hands from altering the settings. This model is suitable for houses up to 5 bedrooms if you want the best dehumidifier on the market look no further than this model.